As one of London’s most famous landmarks, the London Eye is an absolute must-visit. Taking you 135 metres into the sky in one of its iconic glass capsules, you’ll get to take in spectacular views of Buckingham Palace, the Houses of Parliament, Big Ben and many more as you take the unforgettable 30 minute ride. 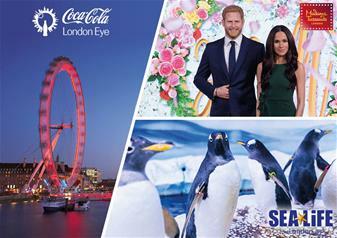 You’ll also get to enjoy the wonderful London Eye 4D experience with special effects of bubbles and mist bringing its beautiful tale to life – this heart-warming adventure is the perfect way to end your London Eye experience! Spend an afternoon mingling with the A-listers at Madame Tussauds in Central London! With legendary film stars including Angelina Jolie and Brad Pitt, some of the most well-known celebrities in the land and none other than the royal family’s waxworks, you will be in for an absolute treat! Walk down the red carpet, experience the Marvel Superheroes 4D experience and enjoy the brand new terrifying Alien: Escape experience that will be sure to send shivers down your spine! Located on London’s exciting Southbank, SEA LIFE London Aquarium offers a colourful experience like no other. Get to see some of the aquarium’s most beautiful residents including the green turtles, the seahorses and for Finding Nemo fans everywhere – clownfish! During your deep sea adventures, you will get to experience the Shark Walk in the Pacific Zone where sharks swim beneath your feet! This fascinating look into the aquatic creatures that we share the world with is perfect for all the family!